Waffen Kessler offers one type of trigger for the rifles with the 98-type action: the Kessler Compact Trigger. Both the pull weight of the first stage and the trigger stop are adjustable. The all steel module is provided with a fixing screw which ensures that it fits securely in your rifle. The trigger is available at our store at the price of € 249. The trigger should either be installed by us or a qualified gunsmith and master craftsman. Labour costs for the installation start at € 65. The total price depends on the work involved and will be determined upon consultation. Please note that triggers will only be delivered by mail on the basis of cash on delivery. 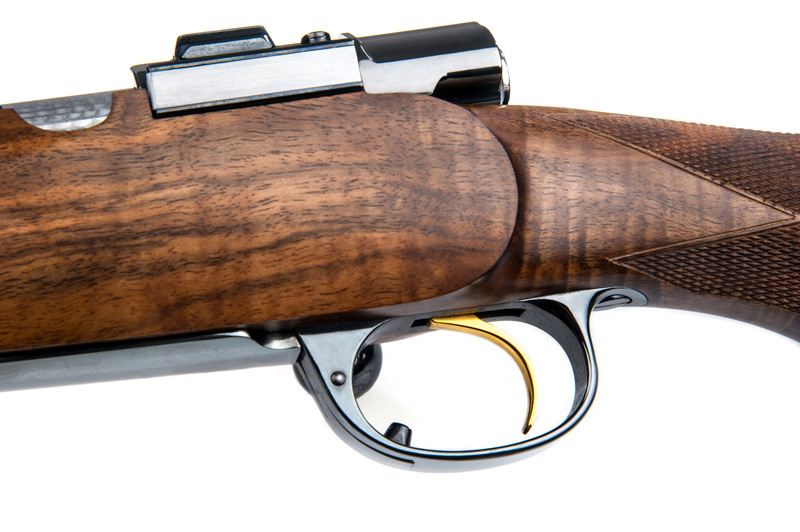 The elegant bolt-action rifles of the gunsmith Roland Kessler are not only stylish and accurate, they also have a first class single-stage trigger. Although Kessler uses the Mauser 98-type action, this trigger does not fit standard 98-type rifles, as Kessler, in manufacturing his fine rifles, has reduced not just the diameter of the cartridge case head but also the magazine dimensions in order to build the most elegant rifle possible. Thus, the complete dimensions of the rifle have been changed and, as a result, the Kessler trigger is simply not long enough for normal 98-type rifles. However, due to popular demand, Roland Kessler has now constructed a single stage trigger for standard 98-type rifles which can be installed in any hunting rifle based on the 98-type action without any difficulty whatsoever. This is truly a conversion worth having done, as shown by an intense field test with one of the new Kessler triggers. The test trigger was fitted in three different bolt-action rifles with a 98-type action and worked perfectly right away. In light of the large number of manufacturers of this type of rifle, this is certainly not a given and should it not function perfectly with your own rifle, it is advisable to consult a gunsmith to help you with the fitting given that the trigger is particularly important in terms of the safety your weapon. The trigger is an all-steel construction and makes an extremely solid impression. A fixing screw ensures that the trigger module will fit the rifle securely. The first stage trigger, the pull weight and the trigger stop are adjustable. To test the trigger’s limits, the pull weight was reduced progressively and the safety of the fitting was tested by tapping the trigger system with a rubber mallet. The trigger remained secure even at 850 grams. This is a value which is seldom seen amongst single-stage triggers for rifles with a 98-type action. The trigger characteristics are those of a match trigger. If the first stage trigger and the trigger stop are carefully adjusted, the trigger breaks extremely crisply much like “broken glass”. The solid, all-steel construction will also likely be the first choice for big game rifles. In this case, however, the trigger should not be set too lightly.